Peter island, Snorkel/Dive "Wreck of the Rhone"
The BVI is dominated by the bareboat charter business and seems at times like a kind of procession of white plastic party platforms trundling around a circuit of palm lined beaches. This is quite different from the cruiser's values and goals but it is an ideal venue for short term charters. The sailing is great. The snorkeling is great. There are lots of mooring balls and the landfalls are just a few miles apart. The British Virgin Islands are a well managed remnant of the British Empire (a British overseas territory). Largely oriented to more small scale, up-scale tourism (bareboat rentals vs. cruise ships), it is the best place for your first cruise. Fabulous, well protected sailing in the Francis Drake channel and many fine anchorages very close together make for very pleasant vacations. As one cruiser boasted: "there are over 80 lovely anchorages here. Why go anywhere else?" The BVI has a very small population of about 18,000 and the whole place is very low key island style with a touch of British pomp. The pictures of the queen are a little out of date and the currency is the US dollar but the islands are free of huge resort complexes and the businesses are mostly locally owned. People from the BVI are known as "Belongers" and are royalty here. It is their country and you are here at their suffrage. They appreciate a polite manner (like most West Indians) and can seem a little prickly. All in all they put up with a great deal of nonsense from the hoards of often less than completely sober visitors and our sometimes rude ways. Always greet people before launching into business. It is a somewhat conservative place: no-one wants to see your sunburnt belly off the beach nor hear you making a drunken fool of yourself away from the bars. Don't photograph locals and never ask questions in customs. 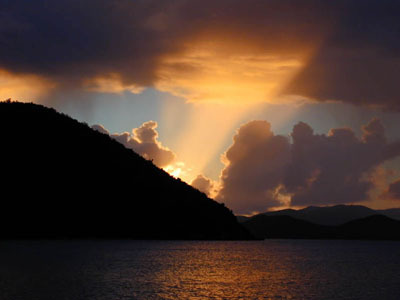 Check-in is easiest at Spanish Town or Jost van Dyke. It is a beautiful place, treat it with respect.